Sapphire buffalo grass has all the benefits of the other high performance soft leaf buffalo grass, such as: needing less water, deep roots, greener in Winter, a good sun or shade turf and it’s hard wearing. However, Sapphire buffalo grass has the added benefit of a finer texture. Sapphire buffalo grass does not rely on fine leaves for its fine texture, but its folding leaf. When Sapphire buffalo grass is mature, its leaf folds at tight angles along its axis, resulting in a fine texture. This is important, because fine leaf buffalo lawns usually have thatch problems, are shallow rooted, poor wearing and are slow growing. A Sapphire buffalo lawn does not suffer from these problems. Not only is a Sapphire buffalo lawn hard wearing, due to its quick recovery from wear damage, but it is also shade tolerant like all other good varieties of buffalo grass. It is an easy grass to grow. What makes a Sapphire buffalo lawn different to other buffalo lawn varieties is its fine texture. Until now, fine textured buffalo lawns have been slow growing, and shallow rooted, but a Sapphire buffalo lawn is different. We believe it is the only fine textured, quick recovering buffalo grass in the world. And a Sapphire buffalo lawn also has excellent disease tolerance, and a great winter colour. Hot Weather Tolerance: Excellent/Thrives in hot humid and desert areas. Shade Tolerance: Best Buffalo in shade. Good for 0-60% shade. Often works in 70%, but with reduced quality. Wear Resistance: Excellent, with very fast recovery. 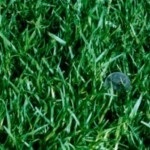 Mowing Height: 35mm – 45mm in full sun, and 50mm to 60mm in the shade. Texture: Fine compared to other good buffalo grass varieties. Soft to touch. Kikuyu grass has been highly popular as a lawn in many environments in Australia for decades. 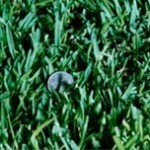 It is inexpensive to purchase, require minimal lawn care to remain healthy, and grows and repairs quickly. However, lawn mowing frequencies will be higher than for any other turf species, often requiring lawn mowing every week in Summer. As well as requiring regular vertimowing to remove thatch build up. Kikuyu grass is also highly invasive of surrounding garden beds. Kikuyu lawn is widely used as the first choice for many community sporting ovals and schools in many states, the reasons for this choice are the same as listed in the attributes just mentioned, but the primary reason for this lawn choice is it’s quick repair capabilities, required by the oval’s use as a sporting venue, or play area. Hot Weather Tolerance: Great/Thrives in humid areas. Shade Tolerance: Good but prefers sun to give better quality. Mowing Height: 30mm – 40mm in full sun, and 45mm to 60mm in the shade. Texture: Course leaf with aggressive runners when growing. is the first pioneer of Australian Soft Leaf Buffalo varieties,premium multi-purpose and economical. 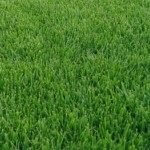 It is an extremely hardy turf and is able to tolerate a wide range of conditions and situations, with excellent shade tolerance and a vigorous rate of growth. It has a broad dark green leaf, and minimal thatch. Excellent for heavy traffic areas and is able to compete against weeds. Shademaster Buffalo prefers a warmer climate however it can also perform well in cooler temperate regions. Maintenance with Shademaster is moderate to high and coupled together with its economical price makes it very popular and an ideal option. Shademaster has a rapid rate of establishment and therefore is ideal for the landscaping industry as well as local governments. Shademaster also excels well in the home garden as it has exceptional growth and can withstand high traffic as well as pets. Shademaster is very versatile; it thrives in full sun as well as partial shade making it an excellent lawn. Shademaster is extremely salt tolerant which also makes it suitable for coastal areas. Wear: Shademaster’s vigorous nature allows it to handle heavy amounts of traffic without damage. A very hardy & resilient Soft Leaf Buffalo, has an excellent recovery from wear and tear. Hot Weather Tolerance: Shademaster is very versatile and thrives in full sun areas. Shade Tolerance: Shademaster has excellent shade tolerance due to its large broad leaf structure and will adapt to semi shady areas. Texture: Has a broad medium dark coloured leaf, with a softer and lusher growth character. Cold Tolerance: It will go into dormancy in colder regions, but recovers quickly early spring. Salt Tolerance: Excellent salt tolerance which makes it suitable for coastal regions. Fertilization: Fertiliser should be well balanced and used to manufacturers specifications; it’s best in light application on a regular basis approximately 4-12 weeks.There are specially formulated professional blend fertilisers that contain nitrogen, phosphorus and potassium. You can purchase from your local supplier or nursery.